United States’ effort to prevent the communists from taking control of Laos in the 1960’s. In this capacity, the Hmong became alliance of the United States in a Secret War against the North Vietnamese communist. After the Vietnam war ended in 1975, the Hmong were targeted by the communists for persecution. They had limited choices, therefore many of them fled to the refugee camps in Thailand and eventually resettled in third countries such as United States, Canada, Australia, France, South America, and other countries. Therefore, the majority of the Hmong that are living in the United States are refugees from Laos. The Hmong are clan and family oriented people. They are known for and proud of their hospitality, friendliness and self-sufficient effort. They like to live close to their family members and clan members so that they can help each other in time of need. ​The Gospel first came to the Hmong people in Laos by the missionaries of the Christian and Missionary Alliance and the Roman Catholic in the late 1940’s. By 1975, it was estimated that 7000 Hmong had become Christians. These Christians continued to share the Gospel with the non-Christians in the refugee camps in Thailand. Many more have become Christians while living in the refugee camps. When the Hmong Christians came to the United States, they continued to spread the Gospel and many more have received the Lord Jesus Christ to be their Savior. 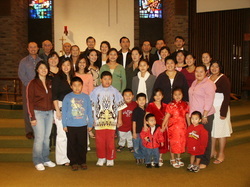 The LCMS Hmong ministries started by way of Lutheran Churches sponsoring Hmong families from the refugee camps in Thailand. With the help of the Hmong people, some Lutheran Churches continued reaching out to other Hmong families and Hmong services and Bible classes were started. From 1980 to 1993 there are three Hmong ministries in the LCMS. To date there are eighteen LCMS Hmong ministries in seven different Districts. There are sixteen Hmong leaders are serving these ministries. The LCMS Ministries continue to grow with God’s grace. We hope that many more families will come to faith in Christ to be saved from their sins, and that many more leaders will also be trained to continue expand the LCMS Hmong ministries throughout North America and the world.